This section is from the book "Building Construction", by R. Scott Burn. Also available from Amazon: Building Construction. We have already stated, while treating upon beams and the strains to which they are subjected, that "ties" are subjected to the strain of tension tending to draw their fibres asunder, while struts or braces are subjected to a strain of compression tending to press or crush their fibres together; and further, that this leads to the practical point that some materials are better calculated to act as ties, such as wrought-iron, and some to act as struts, as timber or cast-iron. In designing framework, and in finding the strains to which it is subjected, it is therefore of importance to know which parts act as "ties," and which as struts. 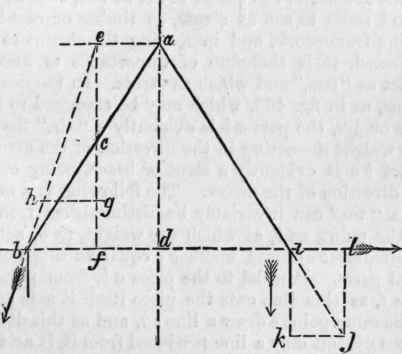 In the combination of beams, as in fig. 466, which may be supposed to represent a crane or jib, the part a b is evidently a "tie," the strain - by the weight d - acting in the direction of the arrow, while the part b c is evidently a strut or brace, being compressed in the direction of the arrow. The following is a method by which a " tie " can invariably be distinguished from a strut. From the point, as b, at which the weight, as d, acts, drop a perpendicular bed, and make b e equal to this from a scale of equal parts. Parallel to the piece a b, from point e, draw a line e f, as this line cuts the piece itself it acts as a strut; from the same point e draw a line eg, and as this does not cut the piece ab, but only a line produced from it, it acts as a tie; if, therefore, when lines parallel to the two pieces be drawn, if the lines cut a piece within the parts of the framing, that piece acts as a strut; if it cuts a line produced without the framing, that piece so produced performs the office of a tie. 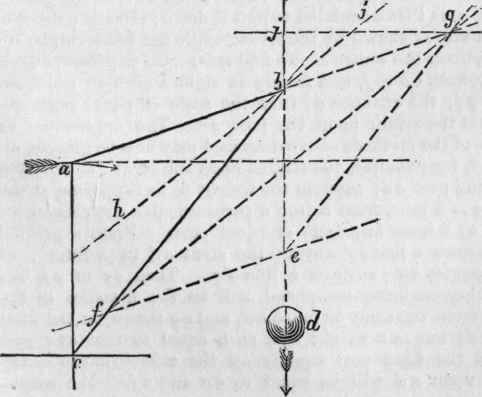 Another method is this - when the parallelogram is completed, as at b f e g, draw its diagonal f g; then from the point ft, at which the weight d acts or exerts its pressure, draw a line parallel to f g, as h b i; then all parts above or in the upper side of this line are ties, as the piece a b; all pieces below it are struts, as the piece b c. What has now been said is further illustrated in fig. 467, the same letters referring to the same parts, as in fig. 466 and its accompanying description. The method of ascertaining the "strains" to which the combinations in figs. 466 and 467 (which may be supposed to represent jibs or cranes, or pieces projecting from a wall, as the wall a c in fig. 466) are subjected, is much the same as that already described. From the point b, fig. 466, drop a perpendicular b d, and make, from a scale of equal parts, be equal to the weight d. From e, parallel to ab, draw a line e f, cutting b c in f, and from b produce a b to g, and cut this in g by a line drawn from the point e parallel to b c. The distance f b or f g is equal to the pressure upon the piece b c, and the distance b g that on the piece a b. The same method is shown, as applied to the jib crane in fig. 467, in which b g gives the strain on the piece or tie a b, the distance g e that on the piece or strut b c.
The strain exercised by the weight d, fig. 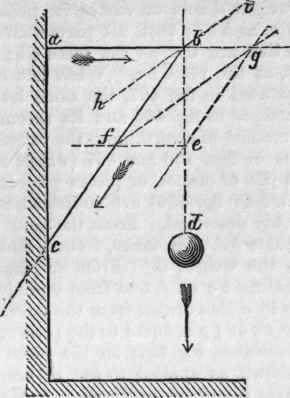 467, on the post or pillar c a, is that calculated to pull it down; the end a describing an arc, as shown by the arrow, while the beam rotates, so to say, upon the centre c. To find this strain or pressure upon a c, produce e b to j, and from g at right angles to a c, draw a line g j; the distance g j from the scale of equal parts represents the strain upon the post c a. The application to trusses of the methods above described may now be glanced at. To find, for example, the strains upon the strut c d, fig. 468, and king post a d; suppose the weight to be supported at the point c is 3 tons, from c drop a perpendicular c e, making c e equal to 3 from any scale of equal parts. From e parallel to a b, draw a line e f, cutting the strut c d in f, from / at right angles to c e, draw a line f g. Then c f or e i, the parallelogram being completed, will be the measure of the strain upon the strut or brace c d, and c g that upon the king post a d; but as a weight acts at h equal to that at c, and presses the king post equally on the side towards h, the strain upon a d will be equal to c g and h j. The weight upon a rafter, as a b, is usually supposed to be distributed in equal proportions between the points of support, so that one-third would be at b, the second third at c, and the remaining third at a. In fig. 469 the weight on a b would on this principle be distributed at four points b, d, e, and a. This diagram illustrates the method given by Mr. Molesworth in his excellent Pocket Book of Useful Formulae and Memoranda for Civil and Mechanical Engineers, to find by construction the strains upon the parts of iron roofs; the principle, as will be seen, is the same as that already described. From the point d drop a perpendicular d f and make d f equal to the weight (w); from parallel to a b, draw f g, cutting the strut d g in g; from g at right angles to d f, draw g h, cutting d f in h. From e make e i equal to (w) plus d h, and draw i j parallel to a b, and j k parallel to g h. From a make a l equal to (w) plus e k, and from l, parallel to the tie rod j c, draw a line j m; then the thrust upon the rafter a b at its various divisions or bays will be as follows: (1) strain upon the length a e = a m; (2) upon e d = a m + i j; (3) upon length d b, a m + i j + f g. The thrust upon the struts will be (1) upon the strut e j = lm+j k; (2) upon strut d g = lm+j k + g h. The strain upon the tie rod will be between (1) j and i = l m+j k; (2) between c and b = l m+ j k + g h. The strain upon the king bolt a l will be twice e k; upon the queen bolts e i, and d h will be equal to d h.